Leslie Nichols uses a variety of found and original text to create images. She is well known for her works created on manual typewriters which are featured in Typewriter Art: A Modern Anthology by Barrie Tullett published by Laurence King in 2014 and The Art of Typewriting by Ruth Sackner and Marvin Sackner published by Thames and Hudson in 2015. Nichols has displayed works at venues including the Huntsville Museum of Art, the Carnegie Center for Visual and Performing Arts, and the Evansville Museum. A recent Artist Enrichment Grant from the Kentucky Foundation for Women provided support for Leslie to create large-scale portraits of women working for social change in Kentucky. Her experiments in letterpress printing were made possible by a 2015 NEA Studio Residency Grant from Women’s Studio Workshop . Her work has been recognized with additional grants from the Elizabeth Greenshields Foundation, the American Association of University Women, and the Great Meadows Foundation. Her residencies include Zion National Park, Vermont Studio Center, Hopscotch House, Women's Studio Workshop, and Can Serrat. Notable public collections that feature her work include the Sackner Archive of Concrete and Visual Poetry, Liquitex Artist Materials, Yale University, and the Library of Congress. Nichols earned a BFA in painting from Fontbonne University under the guidance of Victor Wang and Tim Liddy. She has an MA from Western Kentucky University focusing in gender and women's studies. She currently maintains her studio in Bowling Green, Kentucky where she lives with her partner artist Michael Nichols. Ruth and Marvin Sackner, The Art of Typewriting. London: Thames & Hudson, 2015. 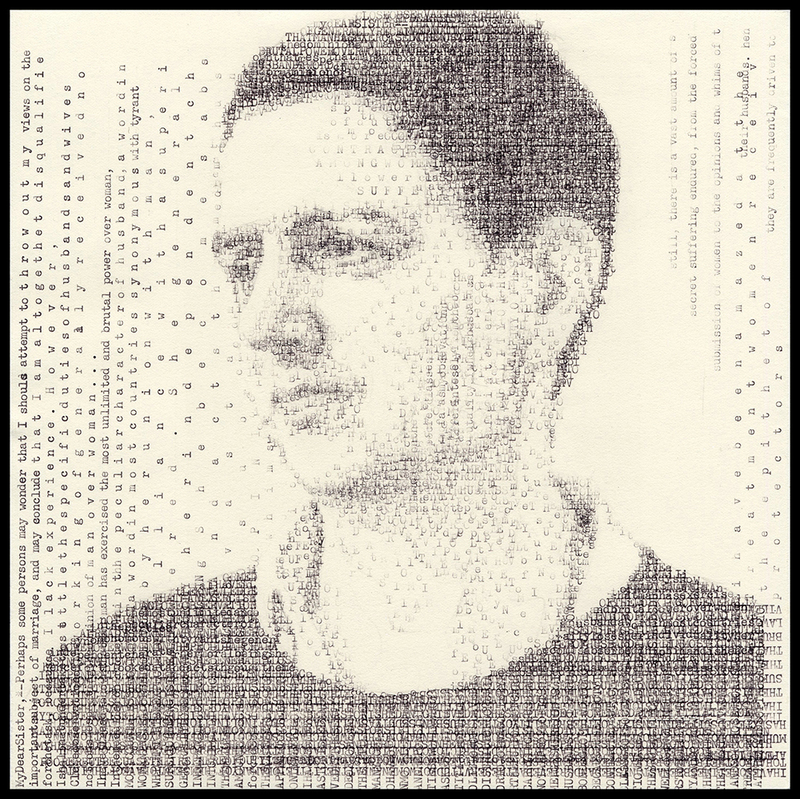 Barrie Tullett, Typewriter Art: A Modern Anthology. London: Laurence King, May 2014. Leslie Nichols, “Textual Portraits” Ecotone: Craft, (Dec 2017). Leslie Nichols, “Alice (Terrell 1904),” “Marie-Eve (Beauvoir 1949),” and “Kathy (Stanton 1892)”, TQ12, Tupelo Quarterly, (June 2017). John Seed, Painted Words POETSartists74, (May 2016). Liquitex Artist Acrylic, “Excellence in Art,” Art in America, Aug. 2008. 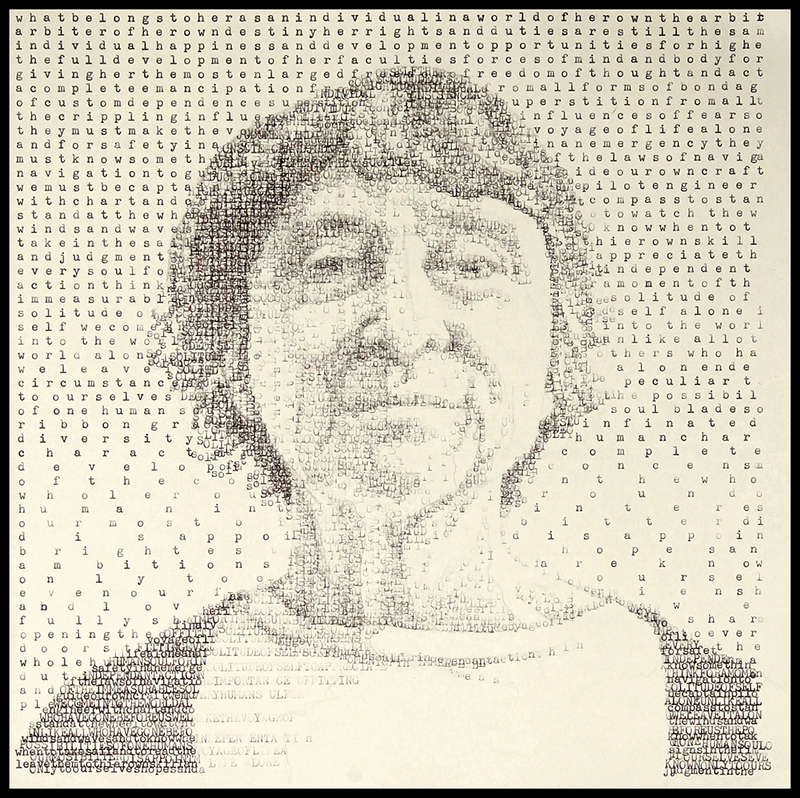 Patty Winsa, “Traditional artist uses typewriter to peck out portraits,” The Toronto Star, (Toronto, Canada), November 26, 2015. “Artist Creates Portraits Of Modern Women On A Manual Typewriter With Historic Feminist Texts,” Women You Should Know, November 20, 2015. Kristine Mitchell, “Images of Contemporary Women Revealed through Textual Portraits,” My Modern Met, November 12, 2015. Lori Gilbert, “It’s written on her face,” The Record, (Stockton, CA) Feb. 21, 2015. Kayla Breese, “Northern National Art Competition juror explains the art of judging art,” The River News (Rhinelander, WI), July 24, 2014. Rick Poyner, “Rediscovering the Lost Art of the Typewriter.” The Design Observer. May 28, 2014. Maria Popova, “A Visual History of Typewriter Art from 1893 to Today,” Brain Pickings. May 2014. Daniel Binns, “Pictures in text: Is this type of thing the last word in art?” Metro. (London, England), April 21, 2014. Kristin Hohenadel, “Striking Designs Form the World’s Typewriter Artists.” Slate. April 4, 2014. Katie Ferriell, “Review: Exploring the Female Perspective,” WKU Herald, (Bowling Green, KY), April 17, 2012. Elizabeth Hise, “Breaking Routine,” Tableaux, (St Louis, MO) Sep. 2009. Noon News, interview with Jennifer Blome, KSDK News channel Five, St Louis, Jan. 15, 2007. Matt Steiner, “Pictures are Worth a Thousand Words,” Montage, (St Louis, MO), Sept. 16, 2004. David Bonetti, “Women Only,” St Louis Post Dispatch, (St Louis, MO), May 9, 2004.